Parks and other green spaces provide both health and environmental benefits, making them a key element in making towns and cities more livable and climate-resilient. Photo: ADB. 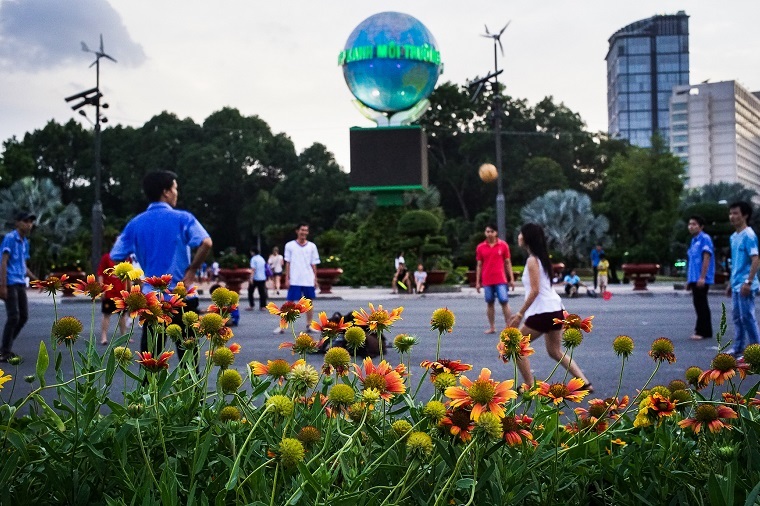 greatermekong – Vulnerable towns in Cambodia, Lao People’s Democratic Republic, and Viet Nam are using “green infrastructure” to stave off the impacts of climate change. The towns of Battambang, Kaysone Phomvihane, and Dong Ha are very different but they have a few things in common. Each is threatened by flooding that stands to get worse in the face of climate change, and each is undergoing a climate resilience makeover to address the problem. Battambang, Cambodia has a large flood- and drought-prone watershed area and sits near the Tonle Sap Lake. Kaysone Phomvihane in Lao People’s Democratic Republic faces frequent extreme flooding along the Mekong River. Dong Ha in Viet Nam is a typhoon-prone coastline city threatened by sea level rise, storm surge, and flash flooding. These communities face long-term harm because of the diversion of their scarce resources from social services and other activities to emergency responses to floods and other climate-related disasters. Nature-based solutions, or green infrastructure, can play a significant role by helping to offset such losses, according to the report Nature-Based Solutions for Building Resilience in Towns and Cities: Case Studies from the Greater Mekong Subregion. Here is how these three towns are using green infrastructure to address the impacts of climate change: An area in central Battambang is part of a major urban renewal zone based on green infrastructure principles and beautification. Under the plan, it will become a central area of green walkways, shops, cafes, and restaurants with the river park at one end connected to a railway station and wetlands park at the other. Another area of the city is being developed as an urban renewal zone with natural drainage that incorporates low-cost but attractive housing for the current residents of nearby informal settlements. The goal is to create a tourist and recreational area in the heart of town that is linked to the river and its green walkways. In Dong Ha, a 285-hectare basin is being redesigned as a new urban development center, which has an attractive green zone that will serve as drainage corridor, water retention facility, landscaped recreation area, and water and air purifier. The plan also includes expanded green space, foot paths, and riverside recreational facilities. It increases permeable surfaces, rehabilitates the port as a recreational and tourist area, and retrofits the market to recycle storm water and better manage waste. In Kaysone Phomvihane, refurbishment is underway for a flood gate and canal system that was found to be highly vulnerable to the threat of flooding caused by increased rainfall and higher Mekong River water levels related to climate change. This includes installing operations and monitoring equipment like pumps and stream gauges, as well as rehabilitation of drainage canals and slopes around the flood gate culvert, using bio-engineering techniques. The plan takes an area-wide approach. It emphasizes bioengineering measures to reduce bank collapse and erosion in order to bring back the natural stream drainage corridor and character. Solid waste, which builds up around the gate entrance, will be regularly cleared. Houses in the area will be raised on stilts. At Savanxay Market, Kaysone Phomvihane, the resilience plan calls for improving onsite waste treatment and drainage. It will also provide an area for vendors, customers, and tourists, with green space and walkways along and to the Mekong River. The plan includes wastewater recycling, walking paths, drainage systems, and green spaces. It also includes an educational component to improve understanding of climate change impacts and adaptation among local people. In all three towns, protection from the harmful impacts of climate change is no longer simply mundane drainage systems and other basic infrastructure. They are using green infrastructure to not only stave off climate change impacts, but also to bring nature back into the town center, provide residents and tourists with recreational areas, and improve people’s living standards.